23 POINT BUYER SERVICE GUARANTEE! When it comes to buying property, you can rest assured that you will receive the absolute best service and representation by working with a Coldwell Banker Best Realty real estate professional. We guarantee our services so that you know exactly what to expect through every phase of the buying process. 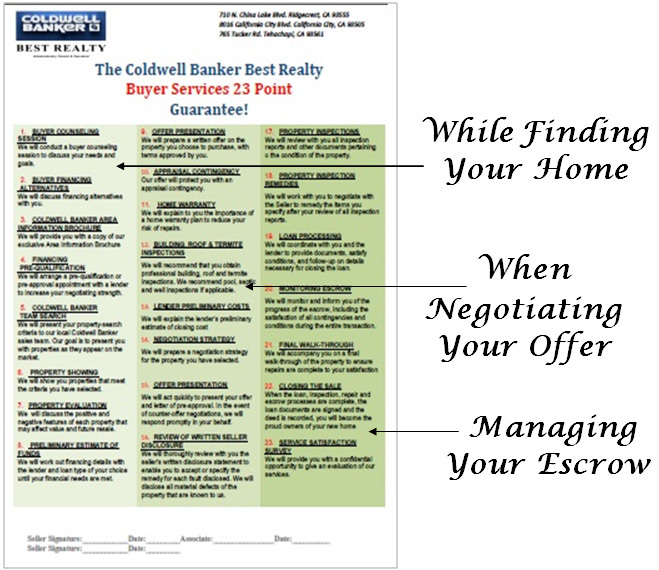 With the Coldwell Banker Best Realty 23 Point Buyer Services Guarantee, you can "Expect The Best"... Every Day Until Your Transaction is Complete! If you would like one of our agents to contact you to review our buyer services, CLICK HERE - or call our office at (661) 822-5553.